so in this story, we’re still focused on Jace and Clary, and Simon has a big part as does Luke. We’re left wondering if Clary will be able to save her mother from the spell that she put on herself as protection against Valentine…and then there’s Valentine. Such a nice name, yet such a nasty person. so…we start off the story basically with Jace trying to trick Clary into not being able to get to Idris to track down the warlock that can help her mom. Simon’s dragged into it (in more ways than 1) and then, Clary some how manages to get herself there. Sebastian – he’s the cousin of the people that the Lightwoods are staying with, yet everyone seems to think that there’s ‘something’ off about him, but can’t quite put their finger on it. read on in the story and you’ll figure that one out . a return of Maia which is always nice – kind of like this chick – she’s helpful and turns up when you least expect it and i feel like there’s so much more we could do with her. maybe she’ll become more important in the following books. we’re also introduced to the Fairies (for the most part) and the Seelie Queen is an interesting one. she speaks in riddles and makes you think about things, yet you do and don’t want her thoughts to come true. again, you’d have to read to get where i’m going with this. 1) do we think that what the Seelie Queen says about Jace and Clary will be the truth? 4) what’s going on with Jace? i mean really? so – i’ll keep reading because i’m happy to say that this book was really good – and the next 2 hopefully will be just as good. What i just learned though is that i should also be reading Clockwork Angel and that series since it’s kind of parallel with similar characters. too bad i didn’t know that before. wonder what i’ve missed…. 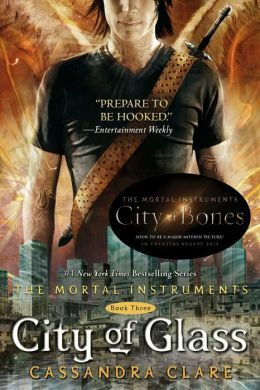 This entry was posted in Uncategorized and tagged Cassandra Clare, City of Ashes, City of Glass, Clockwork Angel, Fairies, fantasy, Jace and Clary, shadowhunters, The Mortal Instruments, Valentine, Vampires, Werewolves, YA lit by iscm13. Bookmark the permalink.